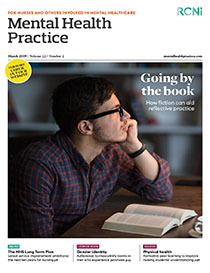 This article outlines the flexible approach developed by a writing practitioner when leading therapeutic writing groups in four psychiatric units at one NHS trust. The author outlines five techniques used during the workshops and considers the benefits to patients, presenting some reflections from patients who attended the groups. Some techniques, especially mindful writing and positive writing, are aimed more at short‐term effects which are helpful in acute psychiatric units – such as bringing calm, decreasing anxiety, increasing mental focus or lifting mood. Other techniques may have more long‐term effects, such as broadening cognitive focus, reframing unhelpful thoughts and ideas, insight and improved self‐expression. The aim of the article is to encourage mental health nurses, occupational therapists and activities coordinators to suggest therapeutic writing to patients and to encourage ward managers to consider introducing writing groups at their units.